Emperor Qianlong, born as AIXIN-JUEELUO Hongli, used to call himself the "Old Man with Ten Great Achievements" in his later days. His lengthy and prosperous reign lasted sixty years. Known to be a seeker of achievements, he tried to reach excellence in all aspects, including politics, military, culture and arts. In 1759, he pacified the rebellions in Dzungar and Muslim areas of northwestern China. In order to commemorate his military achievements, he ordered his western court painters led by Giuseppe Castiglione to make drawings about this campaign to be shipped to Paris to make copperplate engravings. Giuseppe Castiglione, known as LANG Shining in the Chinese-speaking world, was born in Milan of today's Italy. He joined the Jesuit in 1707 in Genoa. In 1715, he reached Beijing and served under three Emperors, Kangxi, Yongzheng and Qianlong. His excellent painting skills had made him one of Emperor Qianlong's most favorite painters. In 1764, at the age of seventy-six, he was asked to prepare the drawings for the making of copperplate engravings with other three fellow missionaries. However, he did not live to see his works becoming copperplate prints. YANG Tingzhang was Han ethnic officer of the Bordered Yellow Banner. In 1759, as the Viceroy of Fujian and Zhejiang Provinces, he filed a memorandum to congratulate the pacification of Dzungar Rebellion. In 1763, he was awarded the title of Grand Guardian of the Heir Apparent and other imperial scholastic memberships. In the winter of the same year, he had received Emperor's thirty three poems; he came out of town to welcome the Emperor's deliverer and setup a worship table in his office to show his loyalty to the Emperor. He filed a memorandum to the Emperor, "Your humble servant is sharing the glory of Your Highness. Your achievement has no comparison in China's long history. As an ordinary man, your servant is too limited to know the value of your success. Your display of power in the West is always in my mind. These gifts will be passed on in my family forever." In 1764, he was reassigned to the Ministry of Labor. In 1765, He became the Viceroy of Guangdong and Guangxi and not for long; he had received the task to make the copperplate engravings. In 1768, he became the Viceroy of Zhidi and Junior Guardian of the Heir Apparent. PAN Zhengcheng, also known as Puankhequa by many non-Chinese speakers, was born in Fujian Province. He was the owner of Tongwen Firm, an international trading business which had made him very rich. 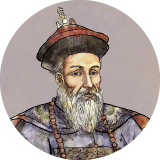 Leading the so-called Thirteen Factories, he was the Guangdong Province's Chief Merchant wearing a sapphire decorated hat issued by the government. As the leader of all international traders, he and nine other international traders signed a contract with the French East India Company on behalf of the Empire to had French engravers to make copper printing plates and print multiple copies. Charles-Nicolas Cochin, born in Paris, was the son of an engravers family. His father was Charles-Nicolas Cochin the Elder, 1688–1754. His mother was Louise-Magdeleine Horthemels, 1686–1767. Both of his parents were excellent engravers. 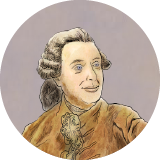 In 1737, he was hired by King Louis XV of France. Later, he became a friend of Abel Poisson, who would have become Marquis of Marigny. In 1751, he became a member of the Royal Academy of Painting and Sculpture, From 1755 to 1771, he was the Academy's sectary. In the autumn of 1756, the model drawings of the "Engravings of Victory" reached France. On December 17, 1766, the French East India Company notified Marquis of Marigny. Marquis of Marigny assigned this task to Cochin. April 12, 1767, Cochin selected engravers for this engraving project. July 1767, another batch of twelve model drawings reached France as well. Copperplate engraving really was a time-consuming work. Cochin had no way but to delay delivery and wrote to China to explain for the delay. Not until 1777, did all the copperplates and prints delivered to China and completed this international art creation project. Ayusi was born in Dzungar. 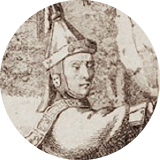 In the summer of 1755, he successfully attacked Dzungar rebel's main camp by surprise with a much smaller force at Gädän-Ola. He was granted to visit the palace to see the Emperor in person in the autumn. The Emperor had Castiglione drawn "Ayusi with Lance and Helmet". Another picture of him was displaced in the Ziguang Ge Hall. In 64, Emperor Qianlong ordered Castiglione to create another model drawing for Ayusi's victory at Gädän-Ola to be engraved in France. Zhaohui, a Plain Yellow Banner Manchurian who was one of the grandsons of the family of Emperor Kangxi's Queen. He entered public service as a worker of the Grand Council. Later he served in the Ministry of Justice, and then became a military officer for the Plain Yellow Banner and Bordered Red Banner. In 1755, he was stationed in Uliastai when Amursana, Prince of Dzungar, rebelled and occupied Yili. He was ordered to move to Barköl. In 1756, Yili was restored and Zhaohui was promoted to Vice General. He commanded a task force of five hundred to clean up remaining rebels of other surrounding areas; thousands were killed. In 1757, he bravely broke enemy's siege and was awarded with military and civilian office titles and also transferred to the Han-ethnic Bordered White Banner Army as a general. He sent task forces to destroy Amursana's pockets of resistance. However, Amursana fled to Russia. Emperor Qianlong sent Zhaohui to the battlefield again and let him take care of the remaining rebels. Taking four hundred horsemen with him, Zhaohui attacked Yarkant City in the spring of 1758. Zhaohui took his men to Black Water and fought an overwhelming enemy led by Khan Hojijan. After five days and five nights, thousands of enemies were killed. However, many of his high-ranked officers also had made their ultimate sacrifice. With his body seriously injured, Zhaohui commanded his remaining men to fortify their camp as a last stand. Khan Hojijan took his time to surround the Qing Army. Emperor Qianlong sent in troops to reinforce Zhaohui and gave him awards for his bravery. The siege lasted for three months. In early 1759, Qing reinforcement finally reached Yarkant City and Zhaohui broke out with his men and regained Aqsu City. Emperor Qianlong wrote a poem to commemorate the Battle at Black Water. In the spring of 1760, a victorious army returned to Beijing. Emperor Qianlong went out of Beijing to welcome the returning soldiers in the wild and gave them awards. Pictures of the officers were displayed in the Ziguang Ge Hall. He died in the winter of 1764. The Emperor personally attended his funeral and gave him posthumous office titles. Later, the Emperor ordered Castiglione to draft the model drawing "Lifting of the Siege at the Black Water River" to be engraved in Europe. 國立故宮博物院著作權所有　Copyright © National Palace Museum. All Rights Reserved.